A busy lifestyle means being mobile. When you need to be out and about, the Drive Medical Spitfire Scout 3 Deluxe is a great mobility option. Compact size and easy disassembly into five lightweight components give the Scout 3 maximum portability. And its nimble maneuverability makes the scooter perfect for negotiating indoor spaces like malls or supermarkets. The Scout 3 Deluxe offers a set of easy to change high gloss color panels in red and blue, metallic grey wheel rims and two-tone upholstered seat. The Scout's comfortable stadium-style seat allows you to easily set the seat height and the armrest width to their most comfortable position. In addition, you can adjust the scooters' tiller angle placing the drive controls where you want them. The control panel features ergonomic delta control handles which make it easier to operate the scooter if you suffer from limited strength or dexterity in your hands or fingers. The Scout's tires won't mark your floors and are flat-free for worry-free travel. Not only is the Scout comfortable, but it offers great performance with a 4.25 mph top speed and a 9 mile maximum cruising range. 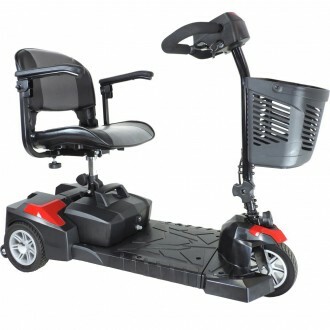 The scooter's 300 pound maximum weight capacity lets it accommodate a wide range of users. Go ahead, experience the Drive difference now. Click the button below to add the Drive Spitfire Scout DLX Compact 3 Wheel Travel Scooter to your wish list.